(NEWTON, Kan.) – Creating art that depicts nature, wildlife and historical subjects provides the “awe factor” for three established artists whose work will be on display at Carriage Factory Art Gallery beginning Saturday, November 17. Burneta Venosdel, Carolyn Mock and Julie Gowing Hayes will give artist talks during the opening reception that starts at 7 p.m. The event is free and open to all ages. The three artists have been creating art for many years using different mediums: Venosdel in bronze and pastel, Hayes in oil and watercolor and Mock in oil. Their work can be found in private collections throughout the United States. Hayes said that growing up on a farm in southwest Iowa was instrumental in her development of a deep-rooted love for the outdoors. Her father’s involvement in conservation efforts through tree planting, watershed developments and improved farming techniques along with her mother’s love of gardening and bird watching taught her a respect for the land and the wildlife it supports. As an award-winning bronze sculptor, Burneta Venosdel feels a strong obligation to record history, she said. “Being raised on a farm in northwest Oklahoma has driven my subject matter to include historical subjects and the animals that I grew up loving.” Her experiences have helped her create dynamic, strong, western-influenced, detail-rich modern pieces. Venosdel, the great granddaughter of northwestern Oklahoma pioneers, is vice president of the Women Artists of the West. The three artists featured in “Creatures Great and Small” will speak about themselves and their artwork at 7:30 p.m. during the show’s opening reception November 17. Live music will be performed by Bob Wambold on piano and Rob Little on bass. Refreshments will be served. 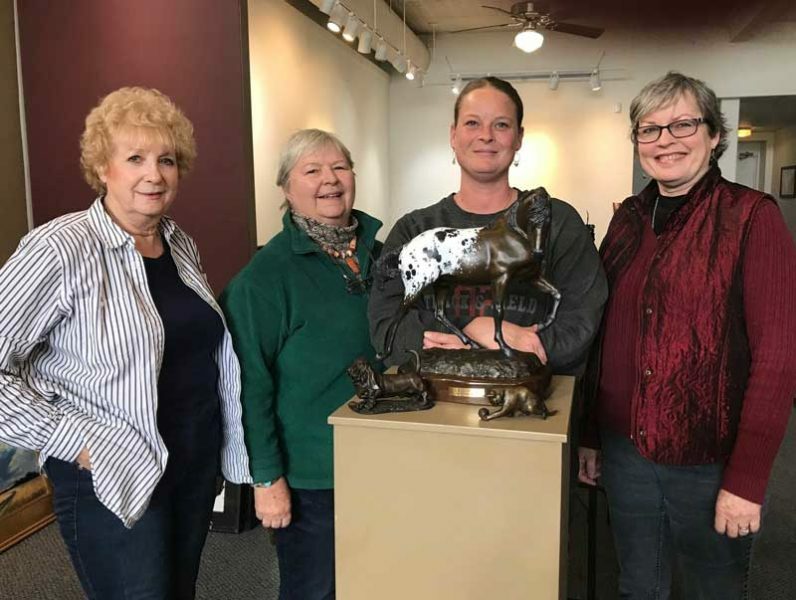 Carriage Factory Art Gallery will feature works in bronze, oil, and pastel of Artists Carolyn Mock (far left), Burneta Venosdel and Julie Gowing Hayes (far right). Mary Lee McDonald, center, is curator for the exhibit, “Creatures Great and Small,” opening Saturday, November 17, 7 p.m.